In order to succeed at online blackjack you need to familiarize yourself with basic strategy before taking a seat at the virtual tables. What it comes down to is knowing how to determine the odds for each winning hand and then wagering according to the most likely outcome. Each set of cards in a game of blackjack has 52 cards. You already know the value of three of these cards; two of yours as well as the dealer’s up card. You can therefore work out the probability of the dealer drawing a specific card. You just need to figure out how many cards of that value are left in the deck and then divide that number by 49. For example, say the dealer draws a 4. You’re dealt a total of 12 so chances are you’ll what to take another card to get closer to hitting 21. If the dealer doesn’t draw a 10, there’s a 32.65% risk of getting a 10 or more, which is a bust. However, it’s equally likely that the dealer will draw a card with a value of 10. Unless the dealer has a soft 17, in most versions of blackjack the dealer would be required to Hit. In this scenario the dealer has a 40% chance of busting. So, if you Stand, there’s a greater chance that the dealer would bust than you developing a strong hand. Instead of having to do all the odds calculations in your head, you can simply use a strategy chart. These charts will show you when the odds are favorable to Hit or Stand. The odds will differ based on the number of decks being used so you this is something that will need to be factored in to your overall strategy. 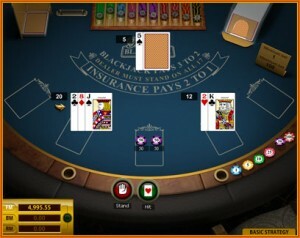 In online blackjack, the deck is shuffled after each hand played. Therefore, when you’re considering your next move you should only focus on the current hand. Previous hands have no bearing on the outcome of future hands. Hot and cold streaks can occur at any time. So while you may be inclined to alter your betting strategy based on which way your luck is running, you’ll be better offer sticking to basic strategy over time. This piece advice is pretty self-explanatory. In online blackjack the “dealer” has specific rules to follow. Usually the dealer is required to Hit on a soft 17 and must continue to draw until they reach a hard 17 or bust. They can’t Split or Double Down. Because their options are more limited than yours, don’t follow their lead if you want to maximize your chances of winning. Even though you have options available that aren’t available to the dealer, this doesn’t mean you should exercise all of them. For example, never take Insurance. Insurance is offered when the dealer draws an Ace. If you take Insurance you can bet cut your original bet in half. If the dealer has blackjack you will be paid out 2:1. However, if the dealer doesn’t have blackjack, your Insurance wager will be lost. Again, by following basic strategy, you will see that an Insurance bet is rarely ever worth making.